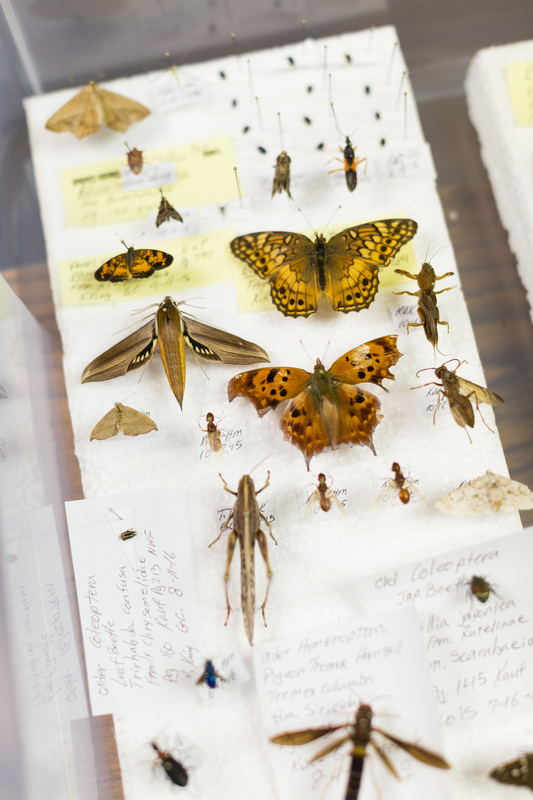 King preserves the insects in his collection by freezing them and pinning them to display boards. All of the legs must be pinned so that the bug will hold its shape. 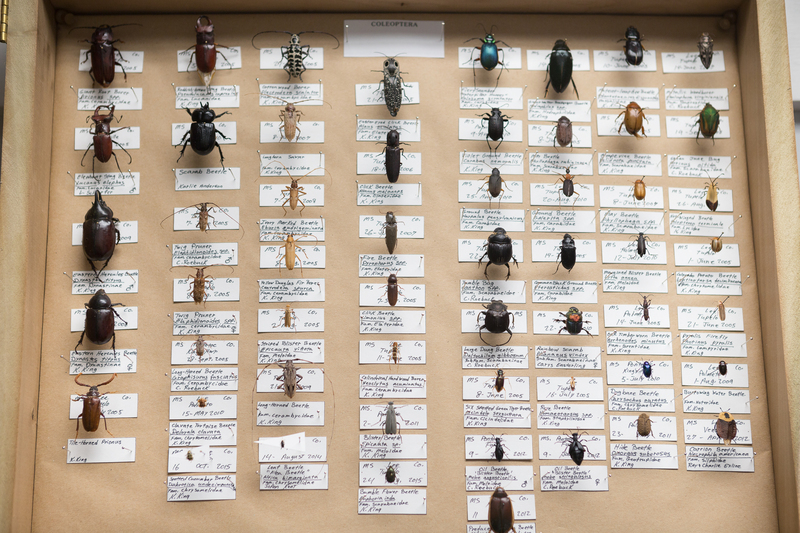 King has hundreds of bugs in his collection. 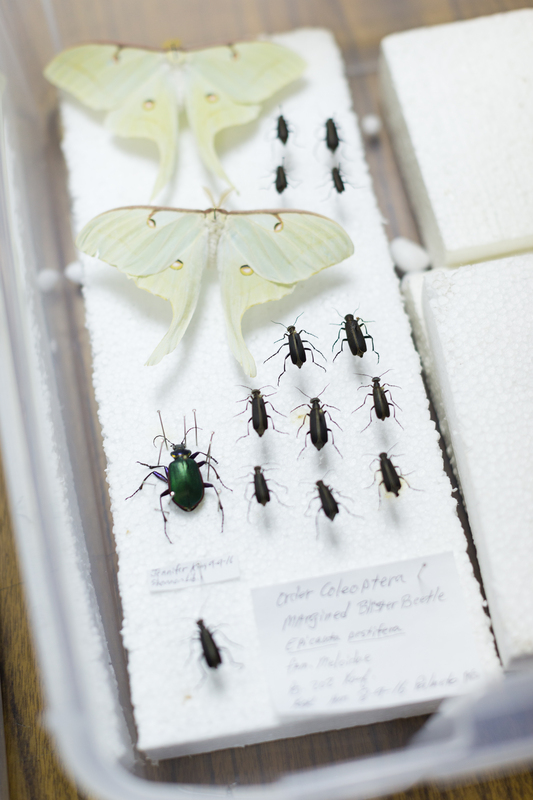 Many of King's bugs are on display in cases at Philips Garden Center, where he works. 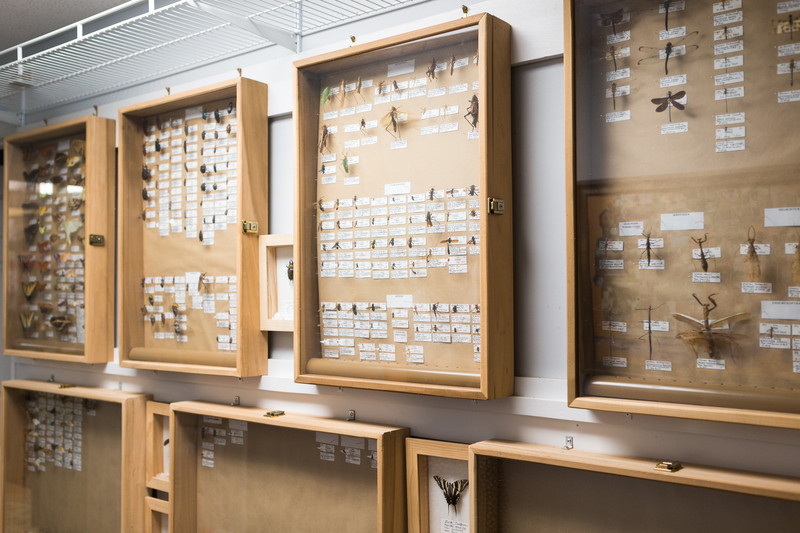 His collection is organized by scientific order, and each insect is pinned with a detailed label. The labels detail where the bug was caught, who caught it and the date it was caught. 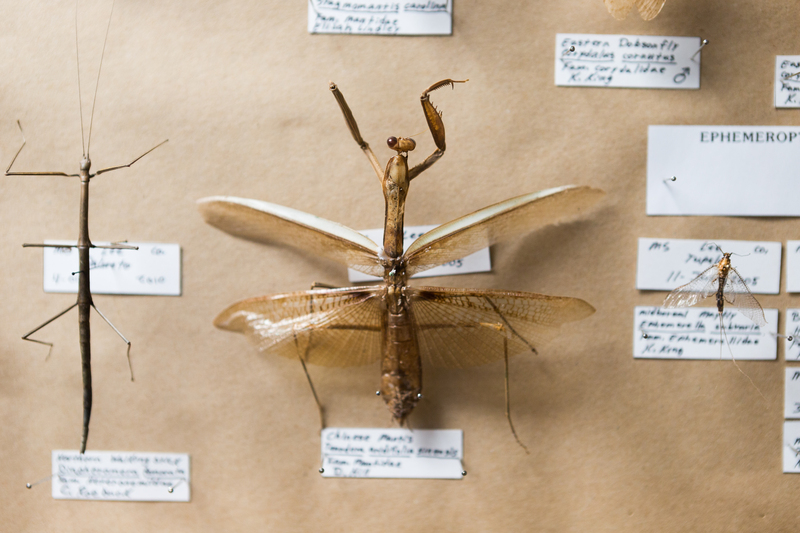 One of King's rarer insects, a Chinese mantis. 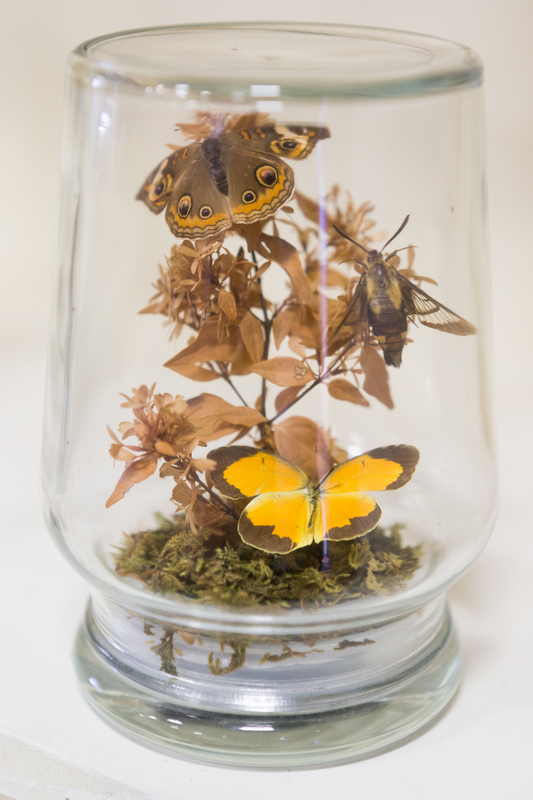 King uses some insects to make display pieces in old jars or other containers. 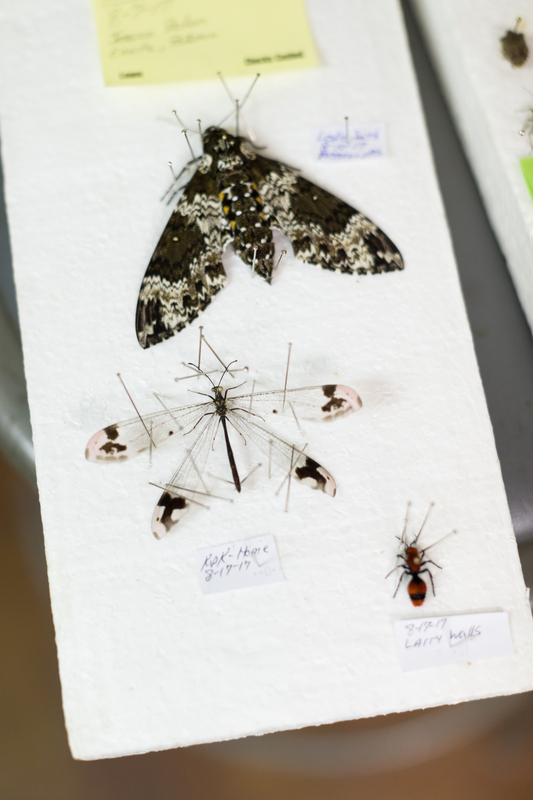 King has been collecting insects for nearly 20 years. King with part of his collection. 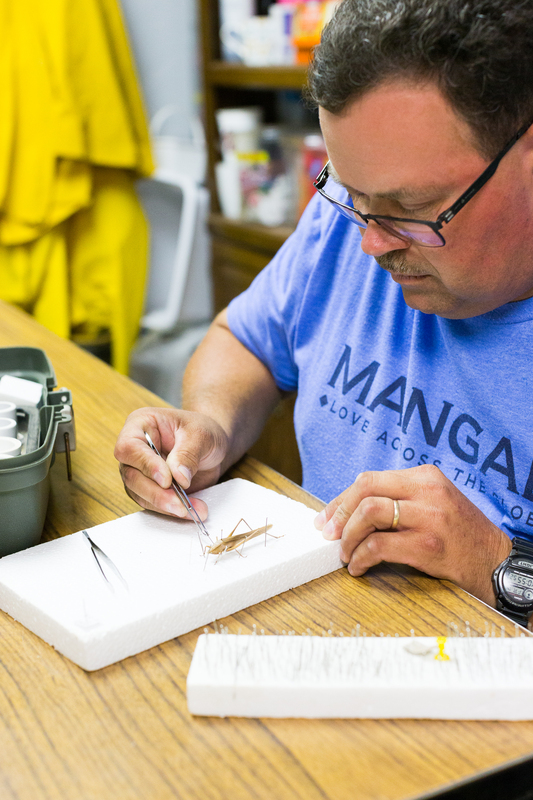 Kenny King started collecting bugs nearly 20 years ago when he helped a co-worker’s son with a school project, but he never stopped. For King, the collection is more of a timeline. It’s a history of moments, memories and people. That’s evident in the insects displayed in cases on the walls at Philip’s Garden Center in Tupelo, where King has worked for 34 years. 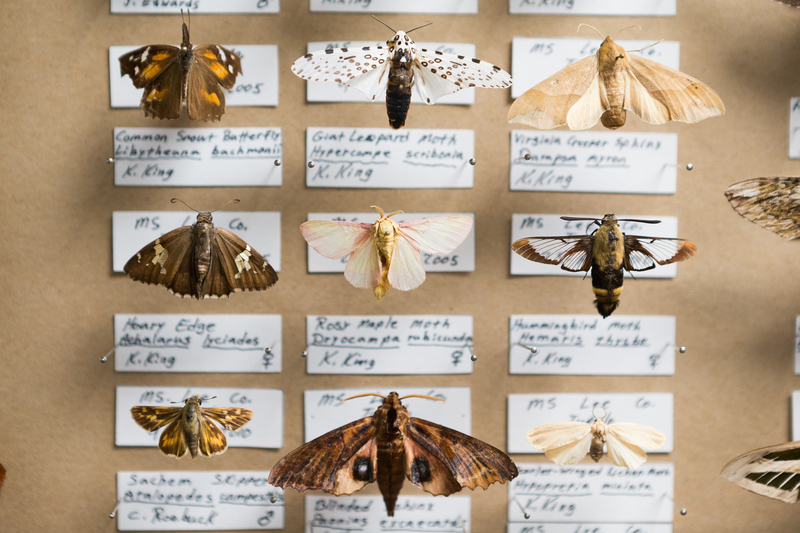 Each insect has a story. He can tell you where each one was caught, how it was found and who caught it, all in great detail. He may have gotten started catching and collecting them inadvertently, but King ended up finding a hobby he loves. He’s constantly reading about insects, marveling at their unique abilities and designs, and learning how to find the most interesting ones. “It’s the thrill of the hunt,” King said. 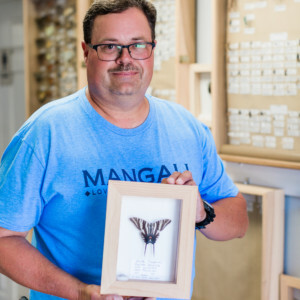 Some of the more striking insects in his collection include a long-horned beetle, Luna moth, Zebra Swallowtail butterfly, Hercules beetle and a Chinese mantis. King is also particularly proud of two rare finds he’s recently added: the Dobsonfly and the water scorpion. If he already has the insect, King typically won’t collect it and rather lets it go. 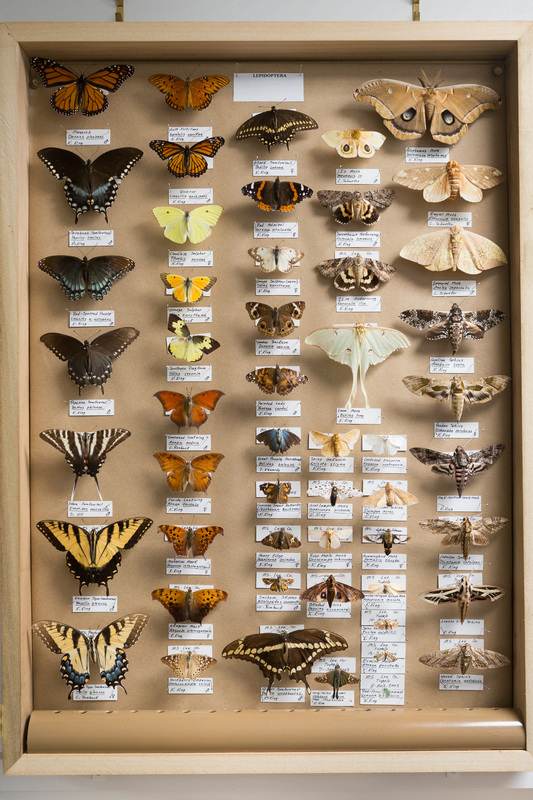 Because he’s been collecting for so long, it’s getting harder and harder to find insects that aren’t already part of his collection. “That’s what I’m on the hunt for now are new bugs,” King said. His strategy: Always be on the lookout. King keeps a plastic container with him at all times, ready to add to his collection. “You never know what you’re going to come across,” he said. When he makes deliveries for Philips’ landscaping service, King is scouting for his next catch. He has a toolbox that he carries in his car with him, always ready should a new insect present itself. 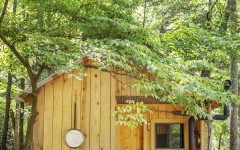 He takes it on vacation, to the gas station, on camping trips — everywhere. He also has a little help. 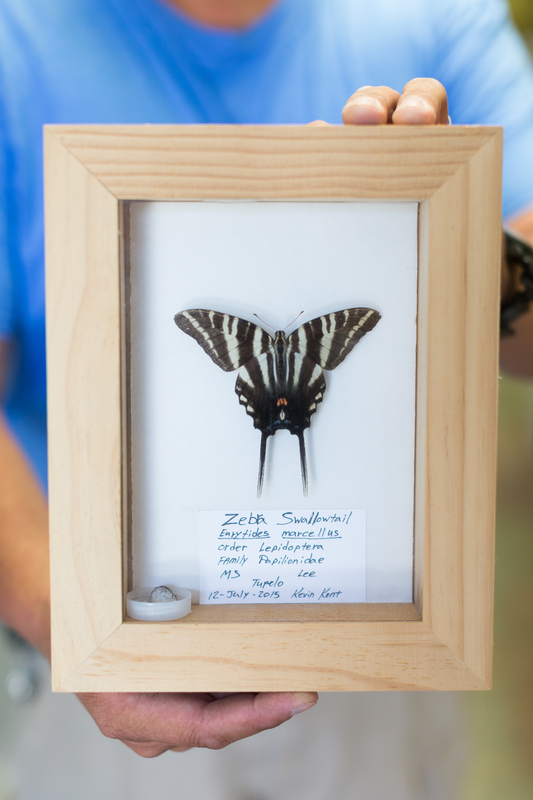 Friends, other employees at Philips and even customers bring him insects that they find. “When anybody finds a bug, they’re always chasing after it,” King said of his co-workers. 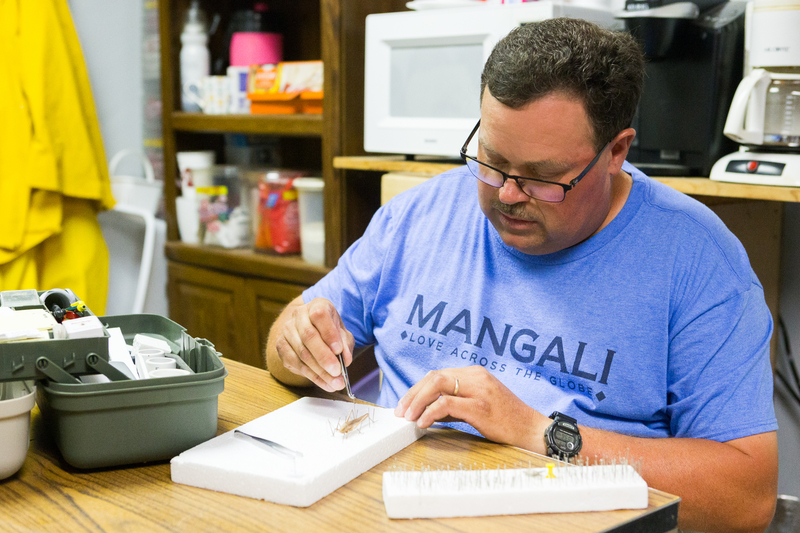 To preserve the insects, King puts a Q-Tip or cotton ball soaked in ethyl acetate in a plastic container with them. They usually die quickly, and once they do, King carefully pins each one to a Styrofoam board and then places them in the freezer. 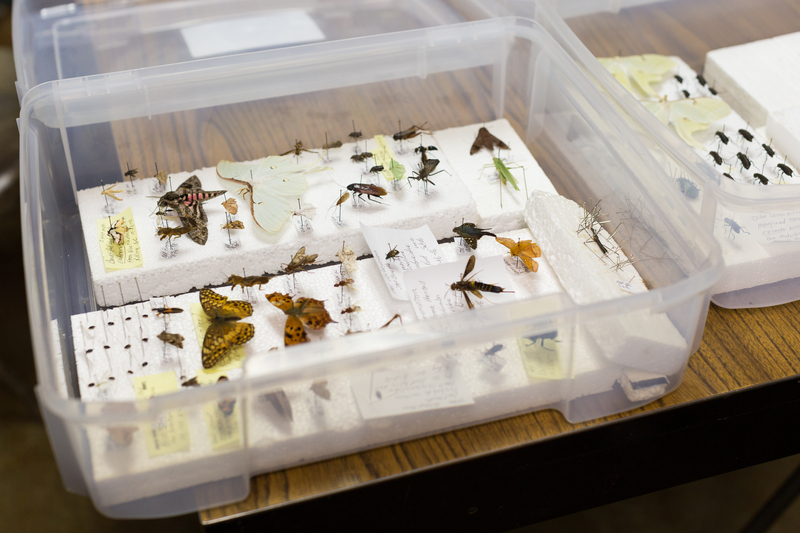 After about a month in the freezer, the insects are free from any parasites that may have been on them. 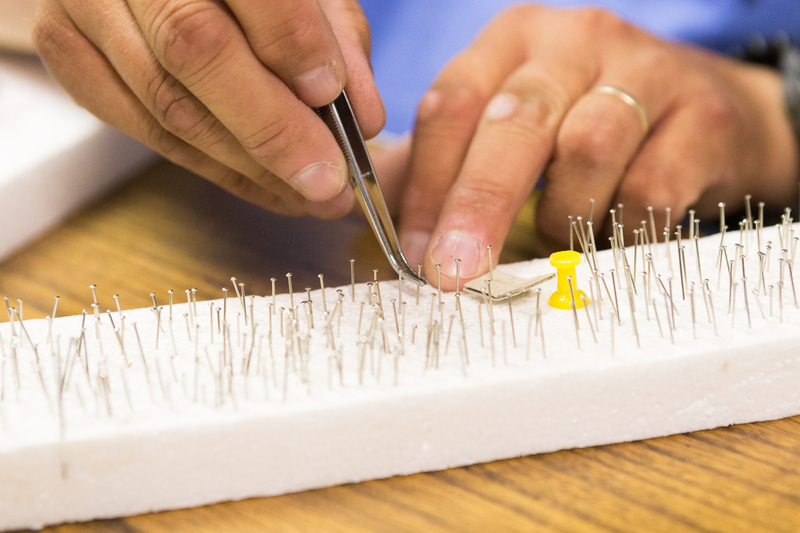 King then allows them to dry before repinning and labeling them. 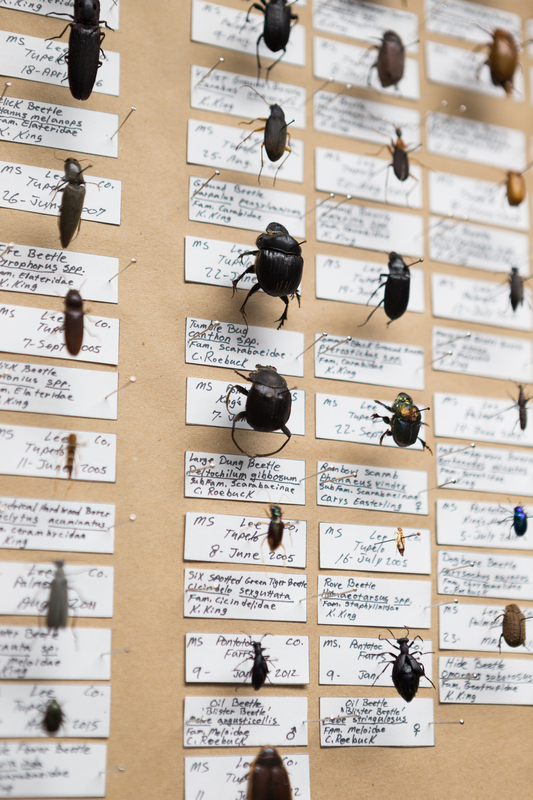 King writes each insect’s information on a small piece of paper and pins it next to the insect to catalog it in his collection. He writes the name of the insect, where it was caught, the date it was caught and the name of the person who caught it. 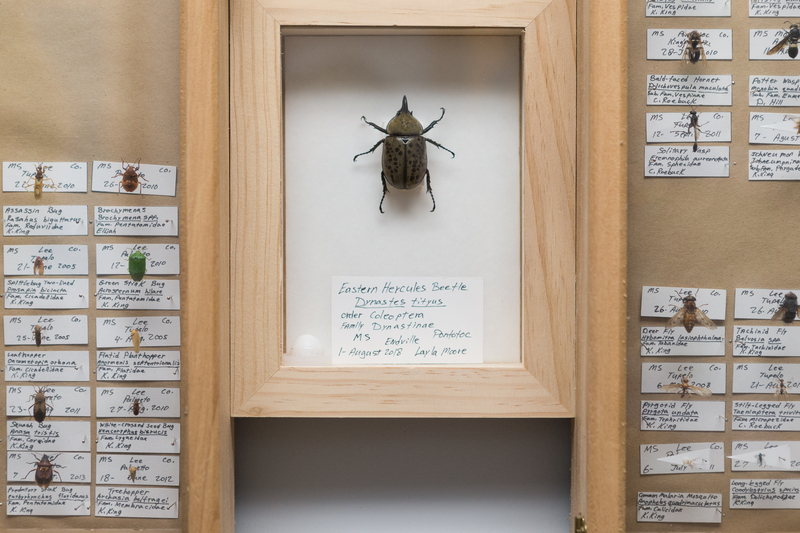 Then, the preserved insect is either put into one of King’s display cases or into storage with the rest of his collection. In the cases, they’re organized according to scientific order. 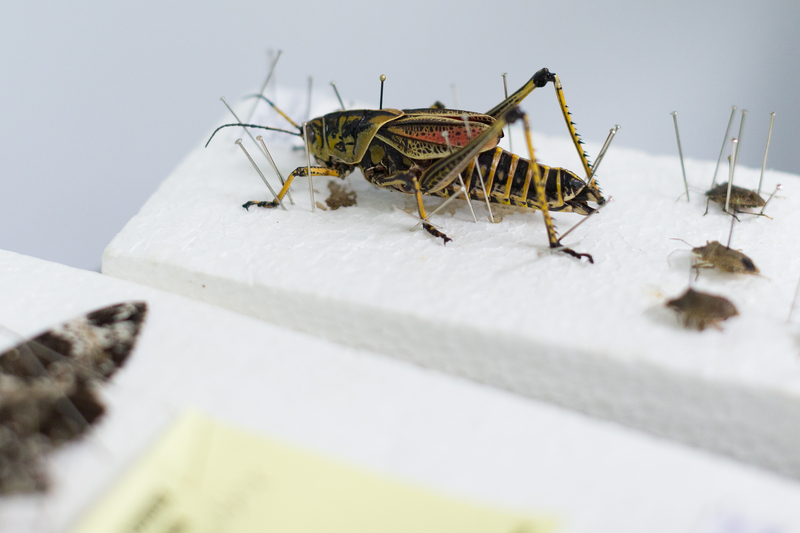 While many of the insects are stored in cases, King gets creative with others. 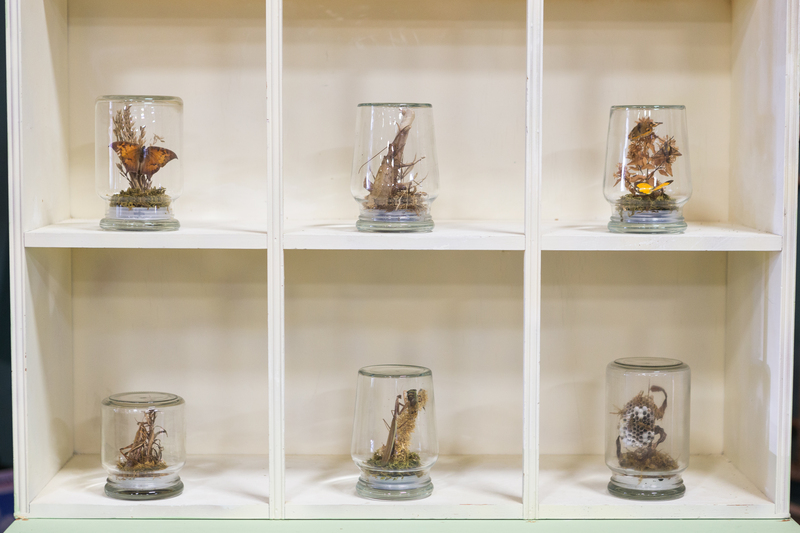 Using recycled glass jars, he creates terrarium-like displays using the insects and dried moss, wood and other materials. 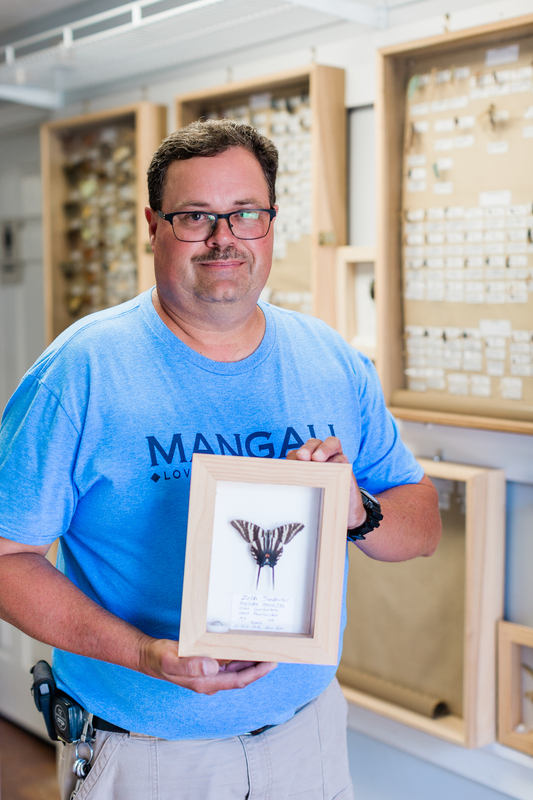 With so many years of collecting under his belt, King is a wealth of insect-related knowledge. For example: Butterflies, dragonflies, bees and wasps are commonly found during the day while moths and beetles are more active at night. 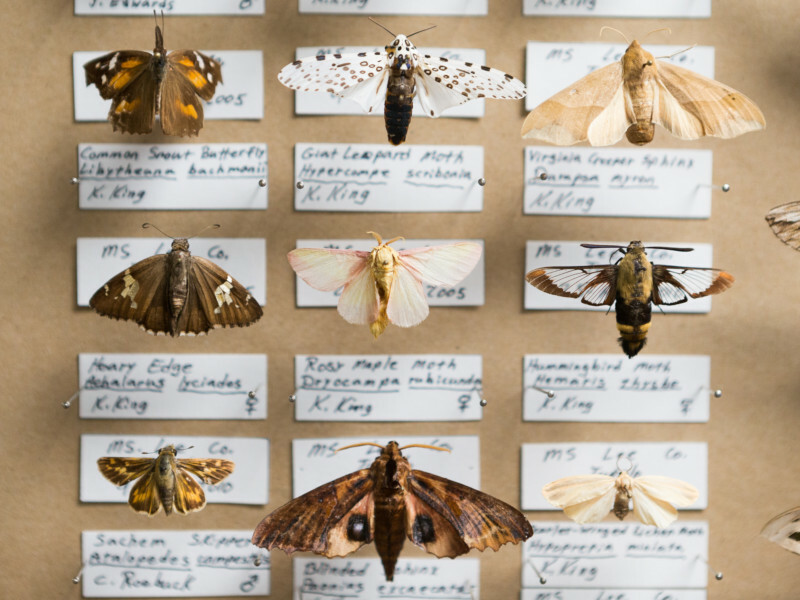 According to King, it’s best to look for moths and beetles early in the morning, when they’re still lingering from the night before. He knows how to hold a butterfly net so that you don’t damage the insect’s wings when you catch it. He also knows where to pinch and hold each insect without damaging its legs, antennae or wings and how to tell the difference between males and females of all kinds of insects. 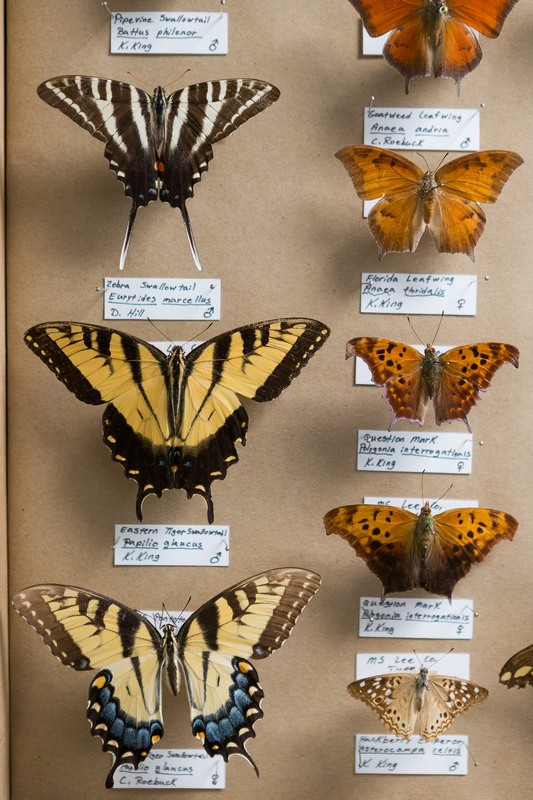 The one thing he doesn’t know, though, is how many insects are in his collection.